This issue of Vibrant Living is a little shorter than usual, seems like the days are shorter than the time needed for those activities allotted for completion…lol….still a very strong newsletter with great information. In this issue you’ll find an article on the benefits of kale and what to watch out for, a new recipe, several health studies, and a reminder to check out my list of warming and cooling foods to help deal with the change of seasons. Enjoy! Kale is an incredibly healthy plant: it has been shown to reduce the risk for multiple types of cancer, has cholesterol-lowering benefits, detoxifying and anti-inflammatory properties, and is rich in powerful antioxidants. It contains health-promoting phytochemicals, flavonoids that have strong anti-oxidant and anti-cancer activities, and is an excellent source of vitamins A, K, and the B-complex vitamins. It is also a rich source of minerals like calcium, sodium, potassium, iron, manganese, copper, and phosphorus. Including kale in your diet can offer protection from vitamin A deficiency, osteoporosis, and iron deficiency anemia. Kale is high in beta-carotene, an antioxidant that helps prevent cancer, heart disease, and certain age-related chronic diseases. Healthy, nutrient-dense kale is a wonderful addition to any diet! Of course one can over do almost any good thing, if one bunch of kale 3 times a week is good then one bunch or more a day would be better, right? Not necessarily, all greens contain certain chemicals that protect the plant from being over eaten by animals and man. Kale contains goitrogens, which can affect thyroid function if eaten in excess. Animals in the wild are much more perceptive of these types of protective chemicals in greens, but man has lost most of this instinctive ability since leaving the wild. This is why you see deer eating a little of this plant and a little of the next and so on. They don’t make a full meal out of anyone plant, although you would have had a hard time convincing my dad of that when the deer where eating the heck out of everything in his garden at what seemed like warp speed before he finally put up better fencing. At one time I ate about 2 bunches of kale a day, usually in my morning smoothie and then perhaps in a blended soup later on. After several weeks of this I did n notice that I was feeling a little off, and after cutting way back felt better again. These days I may have as many as 6 bunches in a week, but then may go for weeks without any at all. For me it’s all about variety, both in the greens and the fruits that I eat. Lettuces have much less of an effect on us, as do celery and cucumbers. If you’re trying to eat as clean as possible for any reason then lettuce would be an excellent choice of greens. I often add romaine to my morning smoothie, and most days enjoy lettuce, and celery juice with a small amount of lime juice in an afternoon juice. 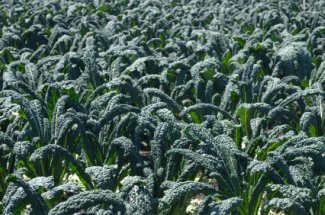 Kale is great and so are collards, bok choy, parsley, cilantro, napa cabbage, broccoli flower and leaf, and so many others, so in the long run you’ll be much healthier if you add variety into your life when choosing greens. 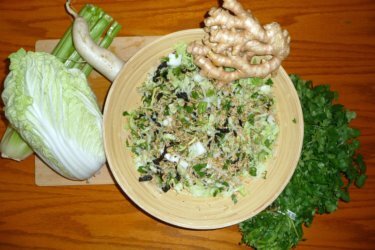 This sprouted salad is a savory dish that I think you might really enjoy. Obesity not only affects work, beauty and everyday life but also makes women susceptible to cancer. A Japanese research team has surveyed 15,054 women in the past nine years, during which 668 women with cancer. Statistics – analysis shows that obese women are at risk of cancer (breast cancer, colorectal cancer, endometrial cancer and gallbladder) than women with normal weight typically 29-47%. For those of you in the northern hemisphere watching the trees lose their leaves and the thermometer drop you may want to consider adding some warming foods into your diet to help you cope. And those of you in the southern hemisphere who are seeing the thermometer rise may want to look at some cooling foods to make the days a little more enjoyable. Funny thing is that nature in its own perfect way takes much of the thought process out of identifying warming and cooling foods. Many of the warming foods come into season in the winter and many of the cooling foods come into season in the summer. Here’s a list of both the warming and cooling foods which may help make your journey to greater health a little more enjoyable. A study in Italy examined the diet of 629 cancer patients (colon cancer, esophageal cancer, larynx, breast cancer, ovarian cancer …), the results showed that the feeding of an apple a day reduced the risk of disease from 9-42% compared to those who do not regularly eat apples. A recent study (April 2011) in the British Medical Journal revealed that 86% of UK adults consumed less than the recommended five portions of fruit and vegetables per day, with 62% consuming less than three portions. The researchers even said that it was estimated that inadequate consumption of fruit and vegetables could have accounted for 2.6 million deaths worldwide in the year 2000! The present study also disclosed that eating JUST one and a half extra servings of green leafy vegetables a day reduces the risk of type 2 Diabetes by 14%! A serving of leafy greens is approx one large handful. Another 2011 study published in the European Heart Journal revealed some startling data analyzed from the European Prospective Investigation into Cancer and Nutrition (EPIC). The data from this study has shown that people who ate at least 8 portions of fruit and vegetables a day had a 22% lower risk of dying from ischemic (to do with blood flow and the condition of the arteries) heart disease than did those who consumed fewer than 3 portions a day.